Tawo Lobsang Palden in an undated file photo. A pioneer of Tibetan pop music, Tawo Lobsang Palden, passed away in Germany on Monday. He was 68. A medical doctor by profession, Palden was also known for composing songs and music. His first musical album Trinkhor was released in 1985 enthralling Tibetans around the world. Since then he added four more albums to a “Trinkhor” series. Palden was on the Board of Directors of the Tadra Project, an organisation providing education to orphans in Kham and Amdo, Tibet. The project was started in 1995. He had a short stint in politics as well after he announced his candidacy for the post of Kalon Tripa (Prime Minister of Tibetans-in-exile) in 2011. But he withdrew soon after due to a sudden illness that required hospitalisation. Tawo Lobsang Palden was born in 1951, in Kham, Tibet. After the Chinese invasion of Tibet, he fled his homeland with his parents. He attended the St Augustin school in Kalimpong for two years and then joined the Tibetan Refugee School in Simla, India. In 1963, at the age of 12 he left India for Germany together with some other Tibetan children. In Germany, after completing his college education, he studied medicine at the University of Heidelberg, earning a degree to become a medical doctor in 1979. Since then he worked as a medical doctor in internal medicine in different hospitals. Since 1983 he worked in the state hospital in Lüdenscheid, which is affiliated with the University of Bonn, as a senior doctor. 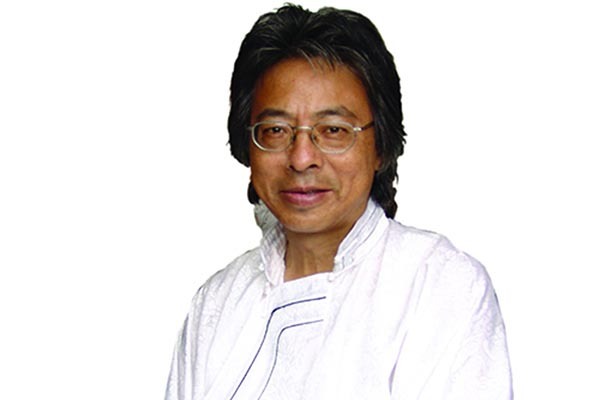 He has been married to Choeni Lhamo since 1973, with three children. Lobsang Palden’s childhood was very much influenced by the nomadic singing in Kham. He learned his first songs from his parents, who both came from Tawo in Kham province. During his school time in Germany he learned classic violin for six years, some guitar, and also the Tibetan dramnyen and flute. But his real passion was song-writing and singing. He was known to have written more than 40 songs, and some of them are played even today. Tawo was trained as a medical doctor. But for me, and lot of my friends, this beautiful man (yes, lots of people find him good-looking) is better known and will be remembered for his soul-stirring songs. There is something in his singing voice that stirs deep emotions such as love for the country, value of human life, and how to live your life as a gentleman of honour and so on. He as also gone into Tibet to build Tadra schools. The Chinese could have poisoned him by first luring him into Tibet, as they did with Panchen Lama, but he went in anyway, and did what he had to do. Plus, for such a project, it takes a man with courage as big as a mountain because there will so many enemies. In fact, one Khampa man insults him on camera by an aggressive handshake that startled Mr Tawo, but his reflex was quick as lightening, and he subdued the bad man. This happens with lot of projects by Tibetans inside Tibet. There will always be that shady character who would try to sabotage the work, but Tawo didn’t care. Condolences to his family. We indeed lost a fine singer and a patriotic Tibetan. He is a real Tibetan singer. I don’t see any Tibetan who can make real Tibetan songs like him these days. All the so-called these young Tibetan singers even in Tibet also all look like bathroom singers. Since the majority of our people don’t know much about songs, they listen to these songs. My advise to our young Tibetan singers is to make songs like him, where there is real creative work. I don’t listen to any of the new Tibetan songs these days. All the proceeds from the sale of his songs were donated towards the education of Tibetan children. None was used for his personal benefits. We have lost a great soul who understands the “wholeness” of Tibet, not the tribal mentality that Sikyong promotes these days at the cost of our dime and dollars! My salutations to this great soul. In passing away of Tawo Lobsang Palden la and Tsewang Norbu la, we lost two strong pillars of Tibetan community in Germany. Younger generation have really a big shoe to fill. Stay strong as in Lobsang Palden la’s song, there will be a time for the sun to rise from under the cloud and shine. Loved Trinkhor albums. keeping alive the Tibetan language and native intonation will keep alive our ancestry and our connections to our heritage. An inspiration to keeping our culture alive in foreign lands are more hospitable than occupied fatherland and strangers kinder than Chinese “liberators”. Keep up your good works life after life! I salute you! He’s a good man. and e really, really cared about poor Tibetan children inside Tibet. I am sure he meant to make a difference in their lives as he grew up as an orphan, and he could feel the pain of having no parents. I have enormous respect for this great man. I heard there is some controversy about his charitable work in Tibet. But I look at the big picture, really. In Tawo Lobsang Palden’s demise, we have lost a patriot who had a burning passion for his lost nation of Tibet. He recounts the beauty of Tibet and its enchanting mountains, the green carpets of grass that covered the length and breadth of the country, magnificent flowers of multiple colours tossing in the breeze, turquoise lakes shimmering in the breeze and white cranes gracefully patrolling the blue skies. He recounts the beautiful women of Tibet and how he admired them more than any other women in the world. His longing for his beloved Tibet which was the only place in the world where his heart was and his undying determination never to surrender to the enemy no matter what ever the circumstances may be. His lyrics are beautiful both in writing and their meaning. They were not written in high-flown traditional Tibetan poetry or flowery words devoid of meaning, but were simple yet pregnant with meaning. He exuded confidence when he was singing yet he was a humble gentle man. His music has spanned some four decades but he continued to sing and had his children also becoming singers like himself. I met him briefly for the first time when HH The Dalai Lama was giving teaching in Switzerland in 2015. We will miss a much-loved patriot and a singer per excellence in his untimely death. My sincere condolences to his family in this sad and difficult time, but they should be proud of their father who has brought the sweetest essence of the Tibetan people’s unique heritage into exile by the likes of Tawo Lobsang Palden to be witnessed and experienced by not only the young Tibetans born in exile but also by others in flesh and blood. By looking at the life of our elderly citizens of Tibet, the young ones who are born must emulate their example and live up to their expectations. Besides he was very knowledgeable on Tibet affairs and interviewed by RFA and VOA on numerous times. And he did some charitable works in his birth area — the Kham region. He has a pan-Tibetan outlook. Pray that he will be reborn as a patriotic Tibetan in Tibet or outside of it.